This might be the most valuable update to StockTrak yet! Last year, over 80% of students who used StockTrak believed it made them a stronger candidate in the job market, and we take that information seriously. 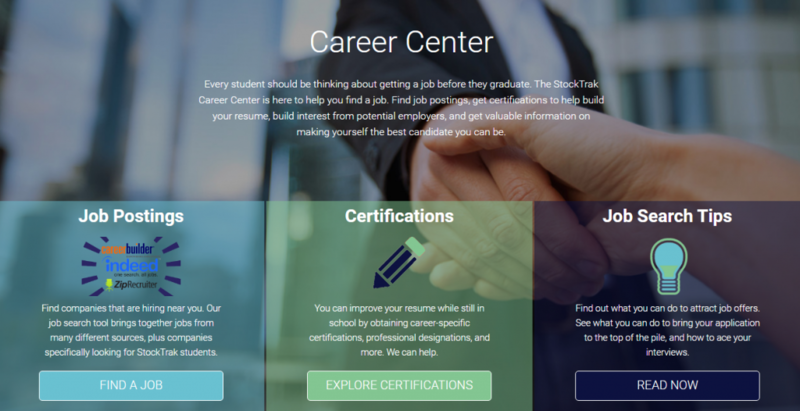 We want to help your students find jobs, and to help, we have launched our new Career Center. The Career Center has 3 main parts, each helping your students launch a great career. Our Job Postings tool brings together job and internship postings from 3 of the biggest sources – CareerBuilder, Indeed, and ZipRecuirter, all into one place. Students can search over 200,000 jobs and internships specifically curated for for current students and fresh graduates in Finance, Accounting, Management, Economics, and Marketing majors. Our Certifications section has valuable information for students looking for great ways to set themselves apart from their peers while still in school. It contains great ways to add certifications like the Series 7 to their resume before graduating, helping their resume rise to the top of the pile. The Job Search Tips section has a lot more “tips and tricks” for students just starting their first real job search. This includes things like how to tailor their resume for keywords of the specific job they are applying for, how to shine during interviews, the most common mistakes graduating students make when looking for their first internship, and much more.